This is the first Battlesystem supermodule. The tiny village of bloodstone pass s menaced by an army of thousands of brigands - orcs, goblins, giants, and human renegades led by a powerful assassin. Outnumbered and helpless, the villagers must pay tribute in gold, food...slaves. Two villagers have traveled far to find aid for their people. They have turned to you, brave and powerful adventurers, as their only hope they cannot afford to pay more than a few silver pieces a day, but their need is great. You are invited to save the people of Bloodstone Pass. Can you organize a defense, train and equip the peasants, recruit allies, gather intelligence?and win the war? Bloodstone Pass is an exciting good aligned, high-level (15+) adventure that combines role-playing with the thrill of mass combat. H1: Bloodstone Pass (1985), by Douglas Niles and Michael Dobson, is the first of the "High-Level" adventures for AD&D. It was published in July 1985. Origins (I): A Battle System. In the early '80s, TSR was considering a project called Bloodstone Pass, which would be a new mass-combat system for D&D, offering miniatures-style wargaming to a new generation of players. That project eventually became Battlesystem (1985). However, designer Niles and editor Dobson weren't willing to let go of the original name, so they proposed an adventure that would use it, and H1: Bloodstone Pass (1985) was born. 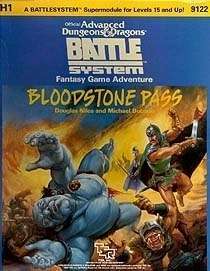 Bloodstone Pass was the first official adventure for Battlesystem, though DL8: "Dragons of War" (1985), which came out around the same time, also included some Battlesystem content. It was also one of the very few adventures to put Battlesystem at the core of its play. Other adventures tended to feature Battlesystem as an option, but Bloodstone Pass made the system a requirement for play; I14: Swords of the Iron Legion (1988) later followed in its footsteps. Origins (II): A Supermodule. The size of D&D modules had slowly been growing over the years, from the scant 8 pages of G1: "Steading of the Hill Giant Chief" (1978), through a norm of 32-page publications, to books like S4: "The Lost Caverns of Tsojcanth" (1982), which included two different 32-page booklets. However, Bloodstone Pass was something more than that: a "supermodule". What did that mean? In the case of Bloodstone Pass, it meant a small boxed publication with a 32-page adventure booklet, a 24-page army booklet, and some of the features that shined in the original Battlesystem: die-cut counters and adventure fold-ups (depicting the village of BLoodstone Pass. Bloodstone Pass was the first of several supermodules from TSR, but the rest would be in a different format; the term would soon come to refer to large, square-bound book that tended to include a small map booklet in a pocket. The first of these were Lankhmar: City of Adventure (1985) and T1-4: The Temple of Elemental Evil (1985). Origins (III): For High Levels. Finally, Bloodstone Pass was also the first "high-level" adventure. It's likely that was intended to be a complement to the "I" intermediate (1981-1988) and "N" novice (1981-1987) lines, which were largely standalone and all set in generic worlds. However, the popularity of Bloodstone Pass would lead to it being the de facto star of the "H" series: three more adventures (1986-1988) would continue its story. Adventure Tropes (I): Episodes & Sandboxes. The early parts of Bloodstone Pass are a largely episodic adventure, as the players encounter a sequence of troubles in the wilderness. Afterward players get to dive into a sandbox, as they interact with the village of Bloodstone. Adventure Tropes (II): The Defenders. Once it reaches that village, Bloodstone Pass focuses a very classic trope: it's the story of the Seven Samurai (1954). The PCs are called upon to defend the village of Bloodstone from bandits. There are even seven pre-generated characters! Adventure Tropes (III): Battlesystem. So what does a Battlesystem adventure look like? Players spend a bit of time building an army, then the latter half of the adventure is a sequence of battles. It's interesting that an entire booklet is required to hold the stats for the various armies, commanders, and heroes. This is due to the complexity of first-edition Battlesystem. When it was revised as the second-edition Battlesystem Miniatures Rules (1989), one of the largest revamps would be the reduction of army stats from a quarter of a page each to a simple line of stats. Adventure Tropes (IV): Our PCs at War. Overall, the combination of a bit of roleplaying setup, then an extensive sequence of army creation and fighting made for a very unique adventure. Decades later, Red Hand of Doom (2006) would repeat some of these tropes, but there wasn't a lot in between. Exploring the Realms. Much like the "I" and "N" adventures of the time, Bloodstone Pass was intended as a generic fantasy release that could be dropped into any world. It details the village of Bloodstone, gives some attention to the nearby town of Valls, and also mentions the nearby countries of Vaasa and Damara. There's actually some indication that this could all be set in Greyhawk, as a circus barker says that his show is "The greatest show on Oerth", but there's no way to fit the generic lands into the main sections of Greyhawk. Two years later, Bloodstone Pass would be retrofitted into TSR's new setting, the Forgotten Realms. However, there was no room for it there either! As a result, Ed Greenwood had to push back the Great Glacier in the north of the Realms, to make space for Damara, Vaasa, and Bloodstone Pass. The final adventure in the series, H4: "The Throne of Bloodstone" (1988), would be the only one to actually carry the Forgotten Realms logo. NPCs of Note. All seven of the pre-gen characters later appear in Forgotten Realms histories, but it's Gareth Dragonsbane who is later identified as the ruler of this land. Orcus is the major villain of the four "Bloodstone" adventures, which make him the second major demonic antagonist for D&D, after Lolth. Here, that's just hinted at, with the level boss being an Orcus high priest. This is the series that brought large scale battles in DnD, yet it is a part of a true milestone in experience. The challenge rating for this is just phenomenal and trully in epic proportions. H3 The Bloodstone Wars is all that's left in this set. How do you mean "in this set"? The product description doesn't indicate any H2 or H4 content either. 'In this set" as in the H-series products; but as my comment as almost a year and a half old, it's no longer valid as H3 has been released since then. I wasn't implying any content from those were in this specific product.